"In quantum mechanics, the physical properties of entangled particles remain associated, even when separated by vast distances. Thus, when measurements are performed on one side, it also affects the other," said Kerstin Kleese van Dam, director of Brookhaven Lab's Computational Science Initiative (CSI). "To date, this work has been successfully demonstrated with entangled photons separated by approximately 11 miles. This is one of the largest quantum entanglement distribution networks in the world, and the longest-distance entanglement experiment in the United States." This quantum networking testbed project includes staff from CSI and Brookhaven's Instrumentation Division and Physics Department, as well as faculty and students from Stony Brook University. The project also is part of the Northeast Quantum Systems Center. One distinct aspect of the team's work that sets it apart from other quantum networks being run in China and Europe—both long-committed to quantum information science pursuits—is that the entanglement sources are portable and can be easily mounted in standard data center computer server racks that are connected to regular fiber distribution panels. The team successfully installed a portable quantum-entangled photon source in a server rack housed within the BNL Scientific Data and Computing Center, where the Lab's central networking hub is located. With this connectivity, entangled photons now can be distributed to every building on the Lab's campus using existing Brookhaven and ESnet fiber infrastructure. ESnet's fibers have been introduced in paths between buildings to enable the distribution and study of entanglement over increasingly longer distances. The portable entanglement sources also are compatible with existing quantum memories, atom-filled glass cells that can store quantum information. Normally kept at super-cold temperatures, these cells can be stimulated using lasers to control the atomic states within them. In work sponsored by DOE's Small Business Innovation Research program (SBIR), the Brookhaven-Stony Brook-ESnet testbed features portable quantum memories that can operate at room temperature. Such quantum memories, engineered for quantum networking on a large scale, have been a longtime "pet project" for Eden Figueroa, a joint appointee with Brookhaven's CSI and Instrumentation Division and a Stony Brook University professor who leads its Quantum Information Technology group. He serves as lead investigator of the quantum networking testbed project. "The demonstration aims to combine entanglement with compatible atomic quantum memories," Figueroa said. "Our quantum memories have the advantage of operating at room temperature rather than requiring subfreezing cold. This makes it natural to expand the test to principles of quantum repeaters, which are the technological key to achieving quantum communication over hundreds of kilometers." 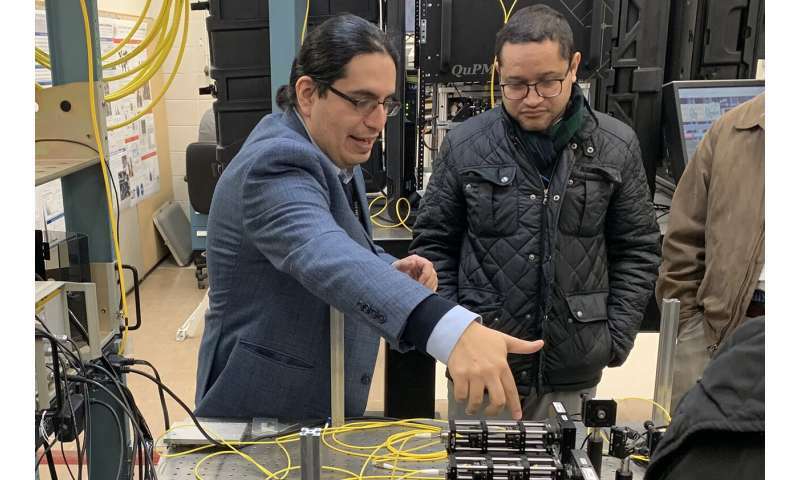 Viable quantum repeaters will allow Figueroa and his team to scale up their ongoing experiments within "local-area" quantum networks to a distributed, or "wide-area," version. In anticipation of this, the team is constructing the necessary optical connections to link Brookhaven Lab's quantum network to ones that already exist at Stony Brook and Yale universities. "Realizing the quantum network with entangled photon sources mounted in server racks, portable quantum memories, and operable repeaters will mark the first real quantum communication network in the world that truly connects quantum computing processors and memories using photonic quantum entanglement," Figueroa said. "It will mark a sea change in communications that can impact the world."